There is a difference in Country and Western (Cowboy) music.....Cowboy (Western) music is about the cowboy and his environment during the days of the cattle drives. If you remember Roy Rogers and the Sons of the Pioneers you'll like this music !!! Other than three originals by the English Brothers (Yodel Stampede/Canyon Trail Yodel/The Western Way) these are mostly familiar classic western tunes from the singing cowboy times.....Back in The Saddle, Don't Fence Me In, and Eddie Arnold's big hit, Cattle Call. From the movie theme's there's They Call The Wind Maria and The Ballad of the Alamo. 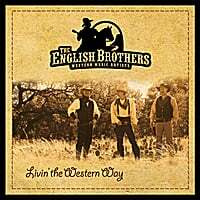 We hope you enjoy our new cowboy tunes and these Wester Classics !